With Win10 version 1809 knocking on your door, and version 1703 knocking on heaven’s door, you may be pleasantly surprised to know that you have some choice in which version of Win10 Pro you’ll get next. There's a trick, and this isn't officially condoned by Microsoft. But it works. Those of you on Win10 Pro version 1703 — that’s my version of choice — just ran out of time, at least to a first approximation. Microsoft won’t be pushing any more security patches onto your machine. Yes, I know some of you figure that’s a feature, but never mind. You’re left with three options: Move to Win10 version 1709, version 1803, or (with fear and trepidation) version 1809. If you’re running Win10 version 1709, you have the option of staying with 1709, moving on to 1803 (and thus giving yourself seven additional months of support), or leaping on 1809. Be careful what you wish. Microsoft has modified its Win10 release strategy and terminology more times than I can recall, but we’ve finally hit a point where some of the settings can be relied upon. Recent tests have shown that it’s easy to choose your next version of Win10 Pro, as long as you follow some simple (if convoluted) logic. Bear in mind that these calisthenics are strictly school-of-hard knocks. Windows Update wasn’t built to be used this way. But the method works. Win10 Home customers are out of luck. Your only choice is to set your internet connection as metered, then use two runs of wushowhide to block upgrades as they come along. And for heaven’s sake, don’t click "Check for Updates." Which version of Win10 is best? Great question. No simple answer. A new Clipboard — features that should’ve been included a couple of decades ago. Notably less powerful than many free Win10 add-ins. Snip & Sketch — screenshot program (now with 3- and 5-second delay options) that lets you mark up shots, but doesn’t let you save them as JPEG or GIF, or automatically increment the filenames. More Storage Sense — works with OneDrive File On-Demand to clean out files you aren’t using. Many folks think this is the feature that malfunctioned in the first released version of 1809 and destroyed data. More minor improvements to Edge, Search, a phone linking app that doesn’t do much, some new admin policies, and a bunch of new emojis. Of course, 1809 is an unknown at this point, with a horrendous history and little real-world exposure. All in all, I’d rather stick with 1703, but Windows’ relentless march is pushing on. As best I can tell, Win10 version 1803 is roughly as stable as 1709. That’s certainly damning with faint praise, but the onslaught of tiny bug fixes has shored 1803 up reasonably well. The one big advantage of 1803 over 1709: It doesn’t reach end of support until Nov. 12, 2019, which is more than seven months later than 1709 (April 9, 2019). Given all of that, I’ve decided to upgrade my production machines to 1803. You may well wish to go to 1709, and pray that 1809 turns out stable enough so you can skip 1803 entirely, much as I’m skipping 1709. Heaven help us all. To upgrade your Win10 Pro machine to your version of choice, the crucial determinant is the so-called Semi-Annual Channel (SAC) date, formerly the Current Branch for Business (CBB) date. That’s the date Microsoft determined that a new version of Windows is ready for businesses, having been vetted by us unpaid plebes. The trick to upgrading to the version of Win10 Pro that you want lies in manipulating the feature update deferral day setting. The dialog box with the setting has changed, but if you’re using Win10 version 1703, it looks like the screenshot. Step 1. Click Start > Settings > Update & Security. Step 2. 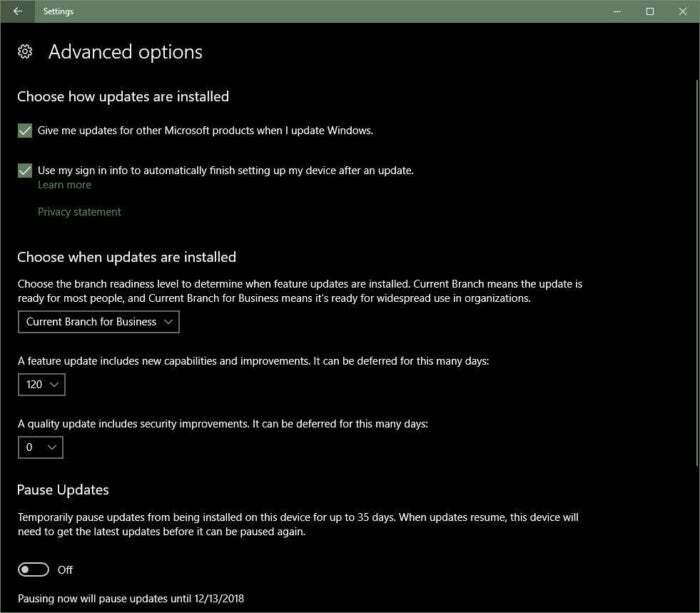 On the left, choose "Windows Update"; on the right, click "Advanced options." You should see a dialog like the one in the screenshot. Step 3. Figure out which version you want to upgrade to. Find its SAC date. Then subtract today’s date from the SAC date (using, e.g., the timeanddate calculator). For example, as of today, version 1709 hit SAC 301 days ago, and version 1803 hit SAC 128 days ago. Step 4. In the dialog, in the dropdown box, choose Current Branch for Business or Semi-Annual Channel. Then, in the feature update deferral box, choose a number that’s a little bit smaller than the number you calculated in Step 3. For example, in the screenshot, I chose 120 days because it’s a little bit smaller than 128 days, and I want to move to version 1803. Step 5. “X” out of the dialog box and don’t do anything. You don’t need to do anything else. In particular, don’t click Check for Updates (yeah, I know, Microsoft says it won’t use that ruse again). Windows should update itself overnight. If for some reason the update gods determine that your PC is unworthy, take it as a good omen, and try upgrading to a different version. When you come back up for air, remember that you can manually roll back to the previous version if you do so in the next few days (Start > Settings > Update & Security > Recovery). Also remember to change your deferral settings back to the numbers you prefer. I don’t know any Windows 7 users who are itching to get going with Windows 10. No doubt there are a few. If you feel like jumping on the treadmill, follow Ed Bott’s instructions on ZDNet to get a free upgrade. You’ll have to upgrade sooner or later (if you want security patches after January 2020, anyway), but there’s plenty of time to worry about that. I feel confident in saying that the mayhem surrounding Win10 hasn't been worth the new features. 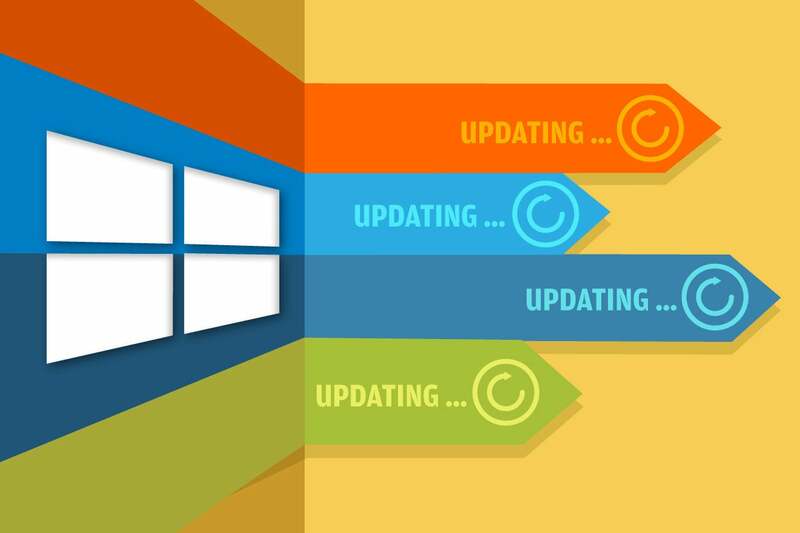 Windows 8.1 remains the most stable version of Windows. Questions? Hit us on the AskWoody Lounge.